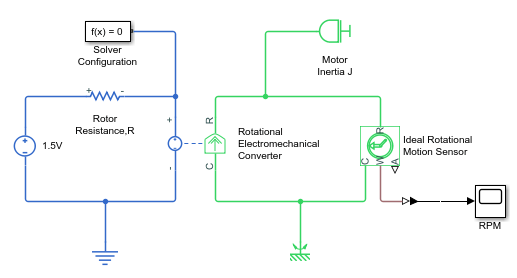 This section contains guidelines for using domain-specific reference blocks (such as Electrical Reference, Mechanical Translational Reference, and so on) in Simscape™ diagrams, along with examples of correct and incorrect configurations. Within a physical network, each domain must contain at least one reference block of the appropriate type. 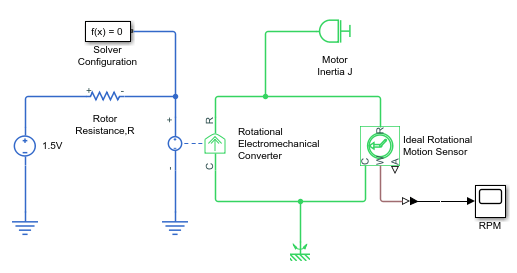 For example, the electromechanical model shown in the following diagram has both Electrical Reference and Rotational Reference blocks attached to the appropriate circuits. Each topologically distinct circuit within a domain must contain at least one reference block. Some blocks, such as an Ideal Transformer, interface two parts of the network but do not convey information about signal levels relative to the reference block. In the following diagram, there are two separate electrical circuits, and the Electrical Reference blocks are required on both sides of the Ideal Transformer block. The next diagram would produce an error because it is lacking an electrical reference in the circuit of the secondary winding. The following diagram, however, will not produce an error because the resistor defines the output voltage relative to the ground reference. Electrical conserving ports of all the blocks that are directly connected to ground must be connected to an Electrical Reference block. All translational ports that are rigidly clamped to the frame (ground) must be connected to a Mechanical Translational Reference block. 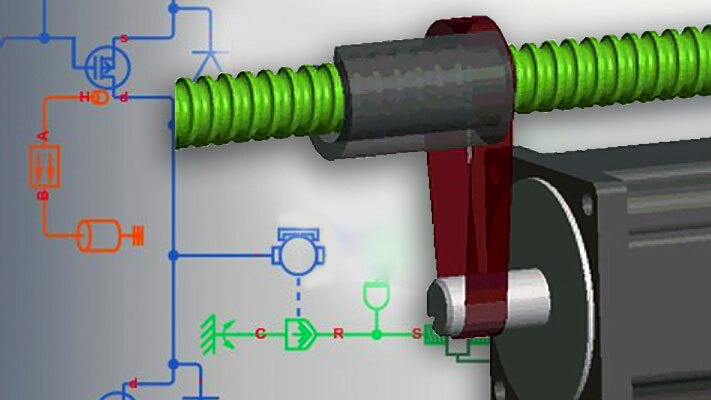 All rotational ports that are rigidly clamped to the frame (ground) must be connected to a Mechanical Rotational Reference block. Hydraulic conserving ports of all the blocks that are referenced to atmosphere (for example, suction ports of hydraulic pumps, or return ports of valves, cylinders, pipelines, if they are considered directly connected to atmosphere) must be connected to a Hydraulic Reference block. For example, the following diagram correctly indicates two separate connections to an electrical ground. Certain configurations of physical modeling blocks can cause numerical difficulties or slow down your simulation. When this happens, Simscape solver issues a warning in the MATLAB® workspace and, if it fails to initialize, a Simscape error. In electrical circuits, common examples that can cause this behavior include voltage sources connected in parallel with capacitors, inductors connected in series with current sources, voltage sources connected in parallel, and current sources connected in series. Often, the cause of the numerical difficulty is immediately apparent. For example, two voltage sources in parallel must have identical voltage values; otherwise, the ports connecting them would not be physical conserving ports. In practical circuits, topologies such as parallel voltage sources are possible, and small difference in their instantaneous voltages is possible due to parasitic series resistance. Mathematically, these topologies result in Index-2 differential algebraic equations (DAEs). Their solution requires two differentiations of the constraint equations and, as such, it is numerically better to avoid these component topologies where possible. There are two approaches to resolving these difficulties. The first is to change the circuit to an equivalent simpler one. In the example of two parallel voltage sources, one source can be simply deleted. The same applies to two series current sources, the deleted one being replaced by a short circuit. For some circuit topologies, however, it is not possible to find an equivalent simpler one that resolves the problem, and the second approach is needed. The second approach is to include small parasitic resistances in the component. In the Simscape Foundation library, the Capacitor and Inductor blocks include such parasitic terms, so that you can connect capacitances in parallel with voltage sources and inductors in series with current sources. If your circuit does not have any such topologies, then you can change the default parasitic terms to zero. Note that other blocks do not contain these parasitic terms, for example, the Mutual Inductor block. Therefore, if you wanted to connect a mutual inductor primary in series with a current source, you would need to introduce your own parasitic conductance across the primary winding. The following diagram models a differentiator that might be used as part of a Proportional-Integral-Derivative (PID) controller. 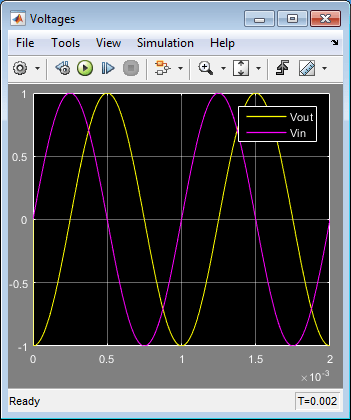 You can open this model by typing ssc_opamp_differentiator in the MATLAB Command Window. Simulate the model, and you will see that the output is minus the derivative of the input sinusoid. Now open the capacitor C block dialog, and set the series resistance to zero. The model now runs very slowly and issues warnings about problems with transient initialization and step size control for transient solve. The cause of the problems is that the circuit effectively connects the voltage source in parallel with the capacitor. This is because an ideal op-amp satisfies V+ = V- , where V+ and V- are the noninverting and inverting inputs, respectively. 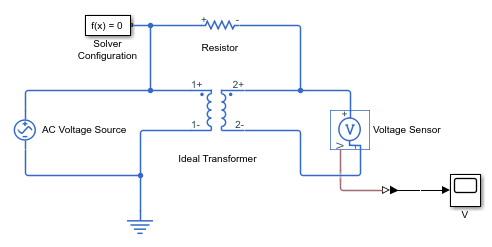 This is an example where it is not possible to replace the circuit with an equivalent simpler one, and a parasitic small resistance has to be introduced.